March entries in the 1876 diary of Ida Isadore Reynolds (1860-1946) of Acton, Maine. Ida would marry John Jotham Shapleigh (1856-1923) in 1881. 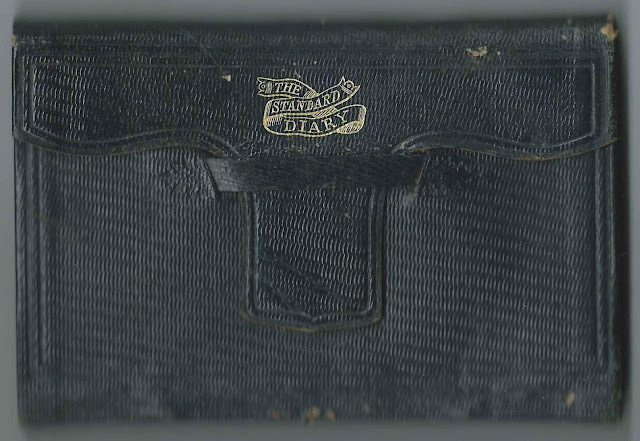 Links to the months of April 1876 and February 1876 appear here and at the end of this post. 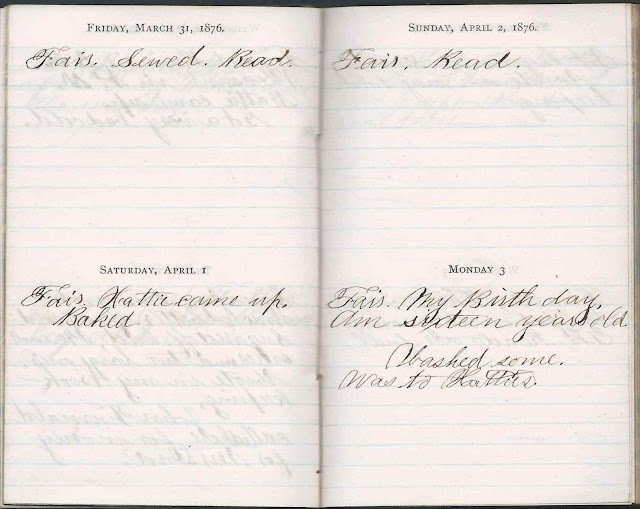 Friday, March 3, 1876: Fair. School finished. I feel real bad; wanted it to keep longer so I could finish Algebra and Rhetoric. "Did not know it was going to finish so soon. Saturday, March 4, 1876: Fair. Wrote down Algebra examples. Went to Enoch's a few minutes. Aunt May and Carl here. Went to Hattie's. John Hilton and Walter Wentworth came there. He called here, but I was down there so he came down. Sunday, March 5, 1876: Fair. Read. Mrs. E Hilton came here. Hattie came up a little while in the afternoon. I went down there a while. 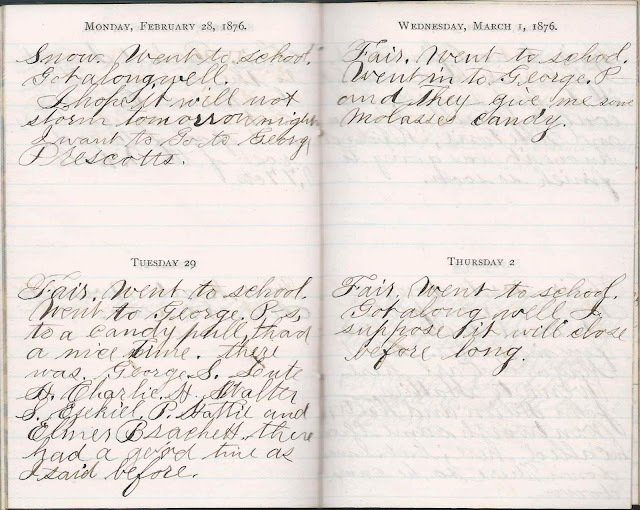 Monday, March 6, 1876: Fair. Washed and Ironed. I feel pretty tired tonight. Hattie came up. Studied Algebra. Lotte came down. Tuesday, March 7, 1876: Fair and very warm for the season. Mother rode to Mrs. Hilton's and spent most of the day. Hattie stayed with me. Made a lamp mat. Went to Hattie's in the evening. Studied. Got a letter from Everett. Hannah and Mr. H-g.
Wednesday, March 8, 1876: Fog and rain. Snow is nearly gone. That is in the road. Made a lamp mat. Augustus Fox's store was burned last night about ten o'clock. Thursday, March 9, 1876: Fair. Set examples down. Hattie came in; we went to Mr. Stevens' to prayer meeting. Hattie went in to Mr. Prescott's for an errand. 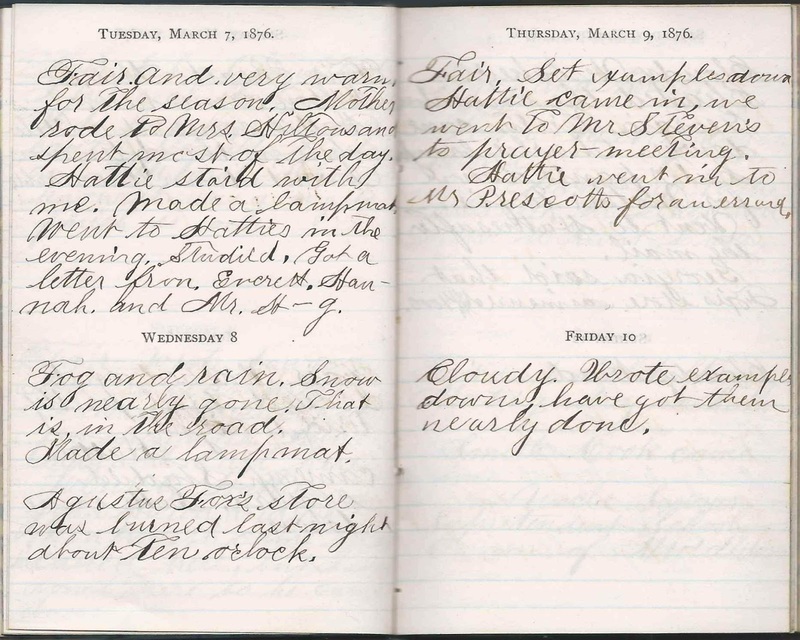 Friday, March 10, 1876: Cloudy. Wrote examples down. Have got them nearly done. Saturday, March 11, 1876: Cloudy. We baked. Cleaned the chamber. Georgia Hilton came down. Charlie brought Lute's pants down for Mother to fix. Went to Hattie's after the mail. Georgia said that Fox's store was insured $4000. 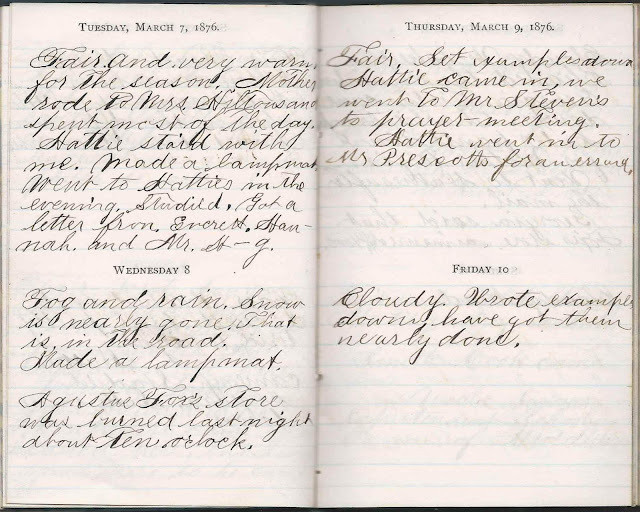 Sunday, March 12, 1876: Cloudy. Read. 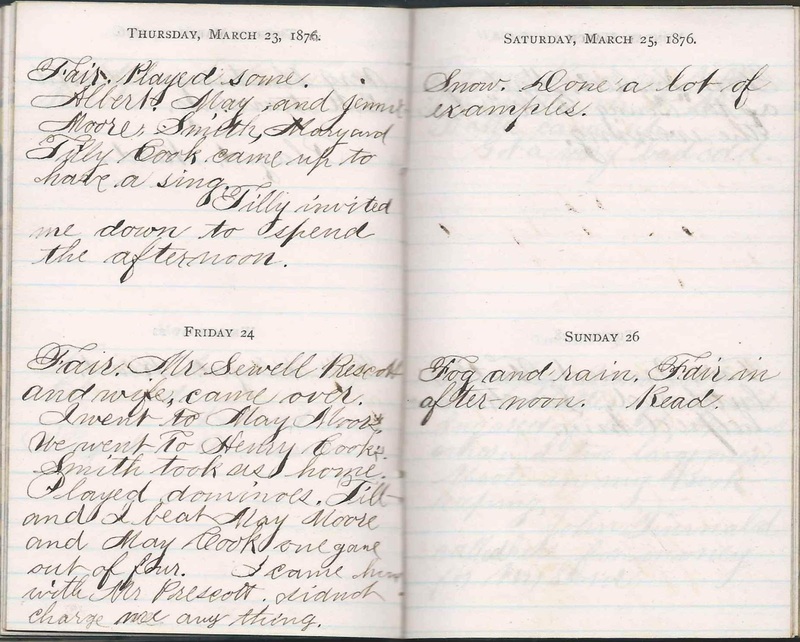 Monday, March 13, 1876: Foggy and Rain. Town Meeting day in Maine. I went up to the Mills; took the "stage" and went to Aunt Lucy's. 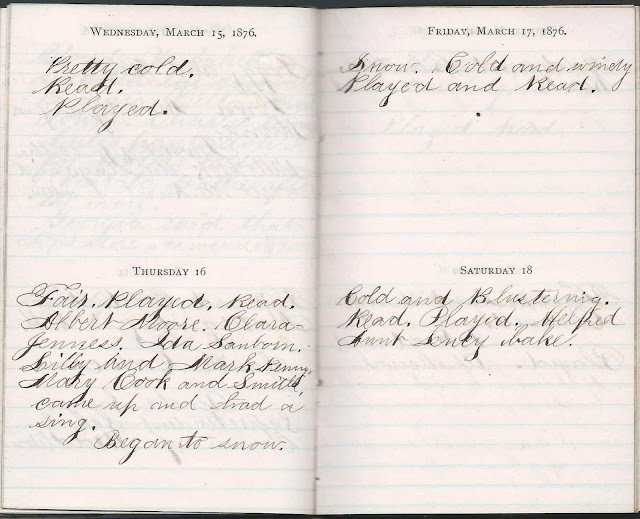 Wednesday, March 15, 1876: Pretty cold. Read. Played. Thursday, March 16, 1876: Fair. Played. Read. Albert Moore, Clara Jenness, Ida Sanborn, Lilly [definitely looks like Lilly here, but in a later entry about a sing, Ida mentions a Tilly.] and Mark Penny, Mary Cook and Smith came up and had a sing. Began to snow. 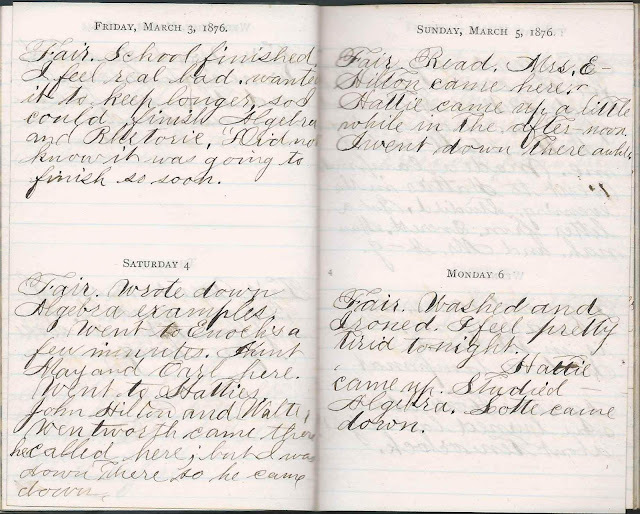 Friday, March 17, 1876: Snow. Cold and windy. Played and Read. 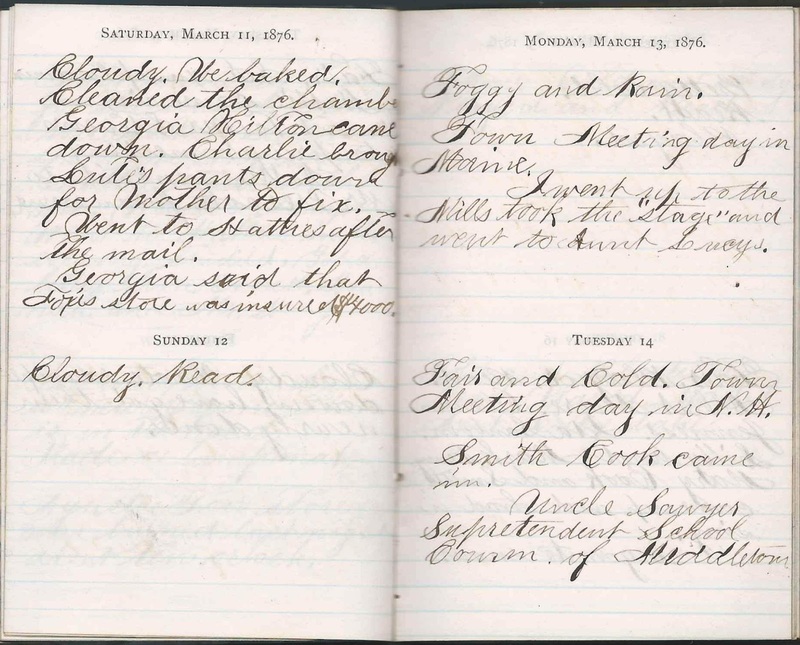 Saturday, March 18, 1876: Cold and Blustering. Read. Played. Helped Aunt Lucy bake. 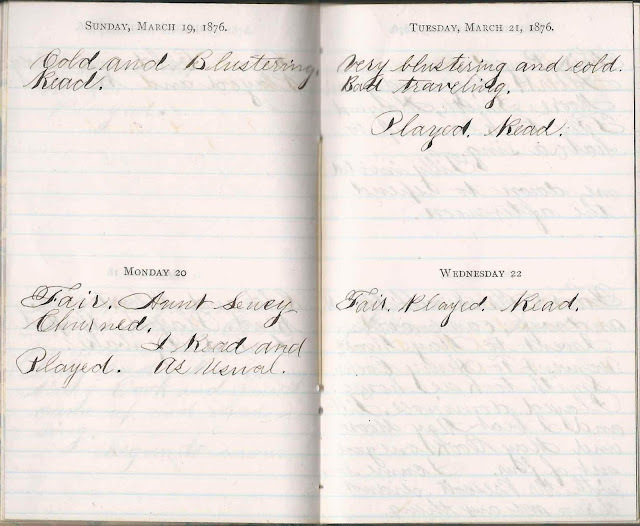 Sunday, March 19, 1876: Cold and Blustering. Read. Monday, March 20, 1876: Fair. Aunt Lucy churned. I read and Played. As usual. 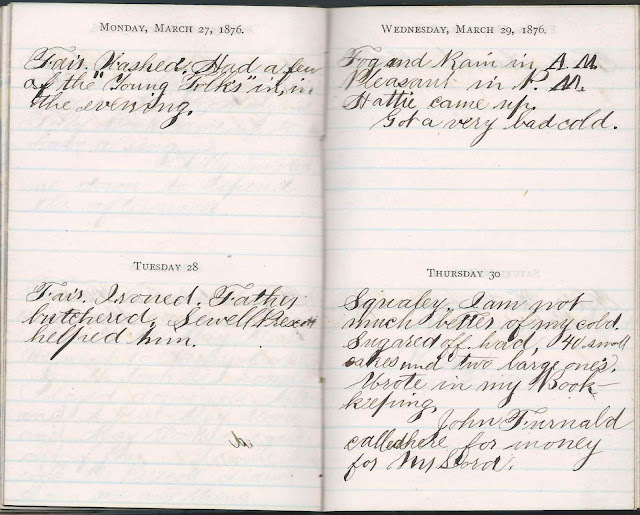 Tuesday, March 21, 1876: Very blustering and cold. Bad traveling. Played. Read. Wednesday, March 22, 1876: Fair. Played. Read. Thursday, March 23, 1876: Fair. Played some. Albert, May and Jennie Moore, Smith, Mary and Tilly Cook came up to have a sing. Tilly invited me down to spend the afternoon. 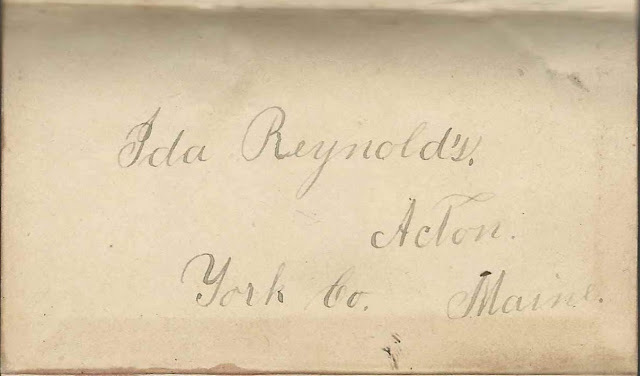 Ida had been visiting with her maternal aunt Lucy Jane (Tupper) Sawyer (1837-1880) and uncle Rev. Seth Sawyer (1808-1892) since March 13, 1876. She returned home on March 24, 1876. Friday, March 24, 1876: Fair. Mr. Sewell Prescott and wife came over. I went to Henry Cook's. Smith took us home. Played dominoes. Till and I beat Mary Moore and May Cook one game out of four. I came home with Mr. Prescott. Did not charge me anything. Saturday, March 25, 1876: Snow. Done a lot of examples. Sunday, March 26, 1876: Fog and rain. Fair in afternoon. Read. Monday, March 27, 1876: Fair. Washed. Had a few of the "Young Folks" in in the evening. Tuesday, March 28, 1876: Fair. Ironed. Father butchered. Sewell Prescott helped him. 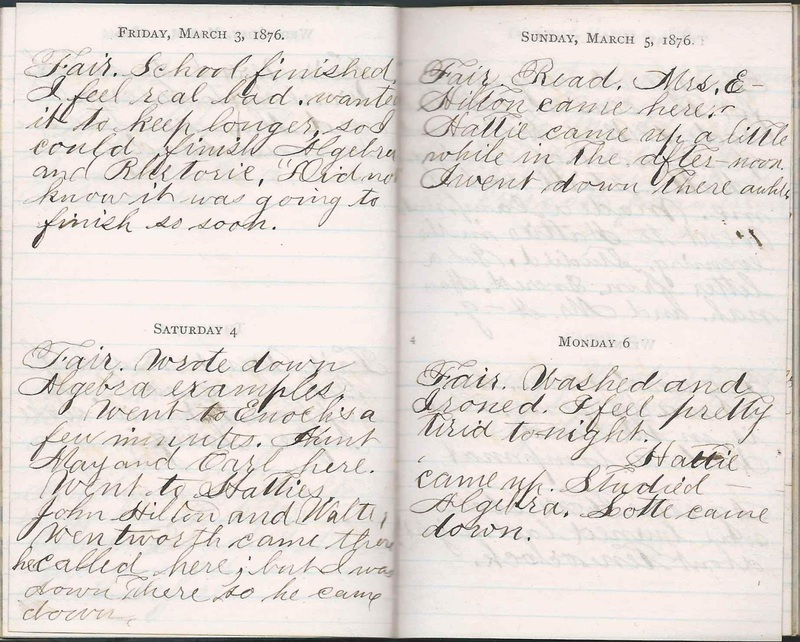 Wednesday, March 29, 1876: Fog and Rain in A.M. Pleasant in P.M. Hattie came up. Got a very bad cold. 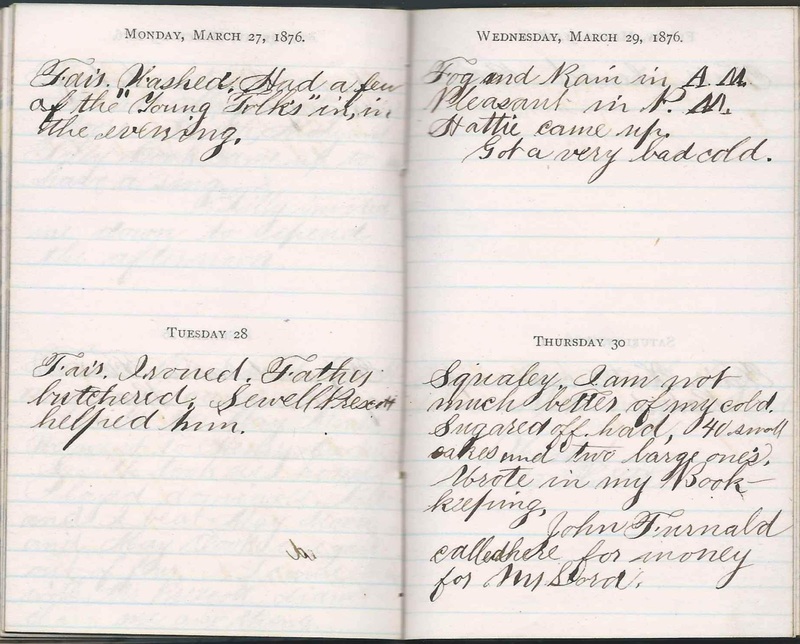 Thursday, March 30, 1876: Squally. I am not much better of my cold. Sugared off, had 40 small cakes and two large ones. Wrote in my Book-keeping. John Furnald called here for money for Mr. Lord. 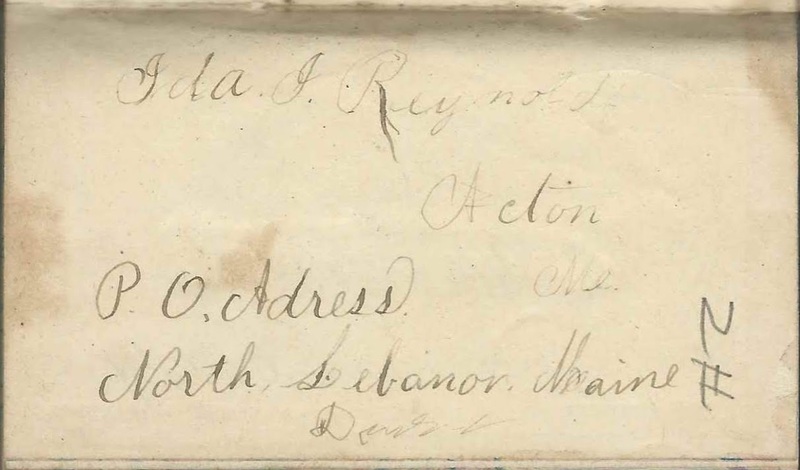 Ida mentioned people in the area of her hometown, Acton, Maine, and in the Milton, New Hampshire area, as she visited from March 13, 1876 to March 24, 1874 with her maternal aunt Lucy Jane (Tupper) Sawyer (1837-1880) and Lucy's husband Rev. Seth Sawyer (1808-1892) at Milton Mills, New Hampshire. Aunt May and Carl - presumably Mary (Ricker) Sherman (1837-1889) and her son Carlos Walter Sherman (1869-1943). Mary's husband and Carlos' father was Enoch Piper Sherman (1836-1922). Hannah - Hannah Francis (1854-1923), daughter of Dr. Daniel Francis (1810-1867) and Christie Ann (Tupper) Francis (-1893), who was a sister to Ida's mother Rachel E. (Tupper) Reynolds (1833-1923); also known as Annie; she would marry James Alexander Buchanan (abt 1850-1906). Albert Moore - Albert C. Moore (1829-1910) of Middleton, New Hampshire, husband of Sabrina D. (Seward) Moore and father of Mary E. Moore, Ida’s friend. Albert - possibly Albert C. Moore (1829-1910) of Middleton, New Hampshire, husband of Sabrina D. (Seward) Moore and father of Mary E. Moore, Ida’s friend. John Furnald for money for Mr. Lord - presumably John Quincy Fernald (abt 1833-1891), Deacon, husband of Sarah (Lord) Fernald (-1895), who was the daughter of Elbin Lord, who may have been the Mr. Lord in the entry. Advance to April 1876 or return to February 1876.